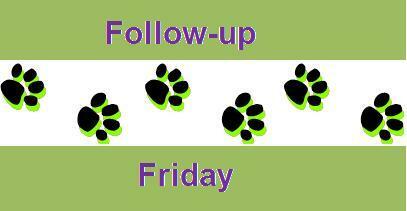 As we take our first foray into Heart Like a Dog's "Follow-up Friday" Blog Hop, we want to thank Miss Jodi for inviting us to join in the fun. The idea is that sometimes you just want to 'follow-up' on something you posted earlier in the week or maybe forgot to mention or think needs clarification based on some of the comments you've received. I think I'm working with all of that here today. I feel terrible that I forgot to include Haopee from My Dogs Love Me for their gracious gift to us this season. See, they won a contest over at Dogs N Paws but because the prize could only be shipped to the US, they gave us their prize instead! I offered to have it mailed to them in the Philippines but they wouldn't hear of it. So Bella has a nice new reflective collar. It arrived yesterday and I haven't gotten a picture of it yet but it looks great. And I promise, Haopee, I'll send a picture right over as soon as I get it. Thank you so much for your kindness and generosity. And thank you Dogs N Paws for running the contest! What a fabulous bunch this community is. More cards! Bella is just embarrassing us with her plethora of Christmas card goodness. Her total (including online greetings): 34! While the post was written last week, our first giveaway contest ended this week and we have a winner: Congratulations to Hilary from Feng Shui Canines! We hope you enjoy your new 8x10 Canvas Print. And thanks to everyone who participated. Thanks for all the kind words about the pictures. Bella was such a trooper for our first real prop-filled photo-shoot. It's her mom who has so much to learn. But at least I finally figured out how to get the lighting in this room of the house to work. Czizo from Life with Beagle noted that her Lulu would have no interest in participating. So allow me let you in on my very secret secret: Treats. Lots and lots of high-value treats. Thanks everyone for dropping by. Hope you're having a lovely Friday and have lots of wonderful fun planned for the weekend! Great follow up! How nice of Haopee! Agreed, when it comes to good poses, it's all about the treats! How kind of Haopee to give you her reflective collar! I've looked at several in the past but have yet to actually purchase one. We do have a reflective vest for Shiva but I don't know that it really does the job. I am interested in hearing how well the collar works while walking in the dark. Hi Leslie! Thanks for participating in FUF, I'm so glad to have you on board. If you'd ever like to co-host please let me know. We pulled out tree out yesterday and the decorations today. I took some photos of the dogs with a Santa's hat on and I'll probably share that one day this week. Have a great week and thank you again for participating! !